Every day the economic importance of national boundaries diminishes. The globalisation of world markets is proceeding with ever-increasing speed, stimulated by developments like the introduction of the single European currency, and even the smallest transactions frequently now include a cross-border element. Business executives and their advisers participating in a transaction need a clear and concise framework of understanding, which will enable them to identify the critical issues likely to affect the course of the deal and to formulate the questions on which detailed advice will be needed. 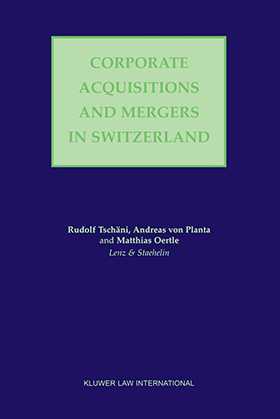 Corporate Acquisitions and Mergers in Switzerland provides a one-stop guide to the practical issues involved for this jurisdiction. The following key topics are addressed: cultural aspects; regulatory framework; common financing methods; antitrust/competition aspects; taxation aspects; employment considerations; procedural formalities; accounting treatment of acquisitions and mergers; future developments. Professional advisers involved in merger and acquisition activity in Switzerland, including bankers, independent lawyers or in-house counsel, tax consultants, accountants, public relations advisers, and actuaries, will find Corporate Acquisitions and Mergers in Switzerland an invaluable and reliable source of practical reference and information. This volume originally appeared as a country report in the loose-leaf work Corporate Acquisitions and Mergers edited by Peter Begg.